I have finally got around to tracking, calculating and graphing my dividend income. It took three attempts to find a tracking/recording system that I like enough to keep using. I found a few trackers online, but none gave me the specifics I wanted without the overhead I didn’t. If you know of any good ones, please let me know. 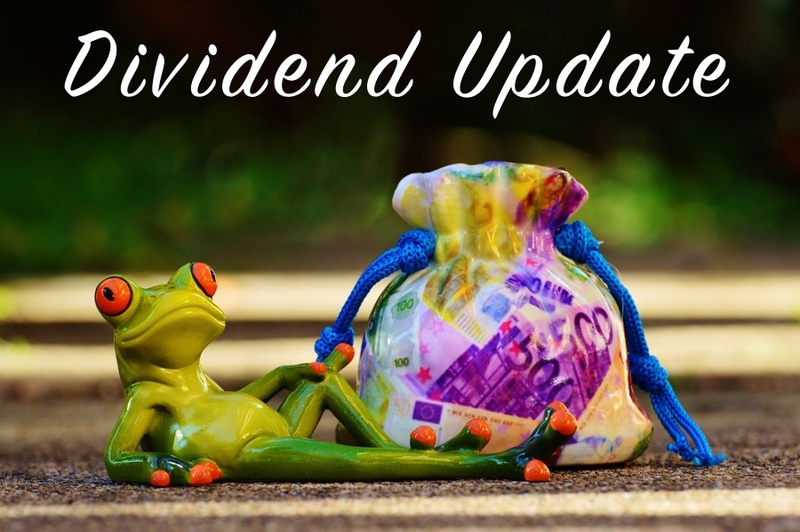 As a result of having a nice system, I will now be providing a quarterly (Feb, May, Aug, Nov) dividend update/interest update for my passive income for those of you who are interested (pun intended). Yes, I am a little late on this one. These updates will cover passive income obtained via the investments listed below from my after tax (non-superannuation) investments. As time goes on, I will see if I can broaden that to include my superannuation. The current problem with super is around how to break it down meaningfully, as a large portion of my super is in an industry super fund. That fund only reports on current total performance of the entire diversified blob, so dividends from that will be unidentifiable. At any given time the dividends for the final column of the graph may not have been finalised. For example, as of the time I am writing this Westpac have not yet announced their dividend for what I am calling “2015 Dec”, where as Harvey Norman have already said they will be paying $0.13 for their “2015 Dec” dividend (and will be paying it on the 2nd of May 2016). The Australian financial year runs from the 1st of July until the 30th of June (180 degrees out of phase with the calendar year). So companies typically distribute an interim dividend based on their half-year performance to December (for the first half of the tax year: July 1st until December 31st). Then they give a final dividend for the performance in the second half of the tax year (1st January to the 30th June). Because the financial year dates/names are almost the reverse of the calendar year (and different for different countries) I am listing the dates with the month that ends the period rather than using “end”, “final”, “mid”, “interim” or some other term that needs context to be understood. Finally, all of the numbers here are grossed up dividends. I plan to do some posts on some of the basics eventually, but for now that link has a nice video explanation. I hope I explained all that understandably, if not hit me up in the comments and I will see if I can fix it. Can you spot where we stopped our dividend reinvestment program? This graph is much easier to explain. 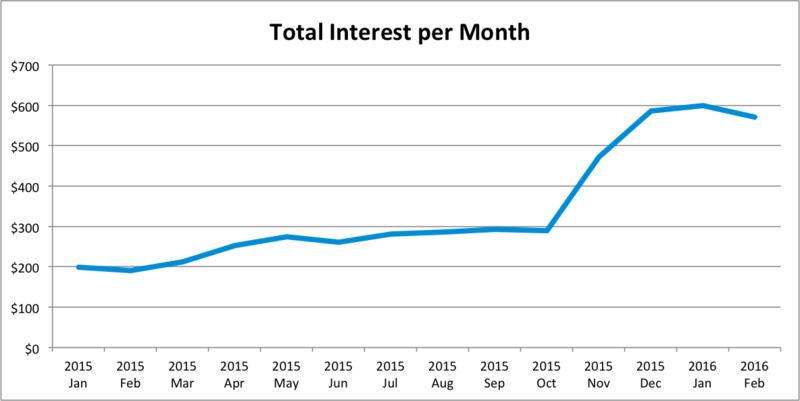 Each month my online savings accounts pay me interest – I graph that. Any term deposit interest is added in when it matures, but with current and previous interest rates I let my last term deposit end without rollover over five years ago. As with the shares, these figures are gross (pre tax) amounts outside super. While I want the shares & bonds graph to keep growing, this graph represents both “safe” investments and also extra capital waiting to be used when the time is right. For that reason, spikes and dips will be more common (and less of a worry) than with the shares & bonds graph above. The jump around October is a mix of consolidating some (missing) accounts, opening a new account to get a better rate, and realising that I was not getting the “bonus rate” on one account. Amazing what a spring clean can do. Finally, I wanted to be able to provide a number to represent how the previous quarter went. However since Australia pays dividends every six months, the number changes wildly based on which quarter it is and when companies announce their dividends. For what I want, that won’t do. I was not after the number as much as I was after checking whether the trend was heading in the correct direction. So for the moment, those of you who want a simple number to measure against are out of luck. For the next post I will see if I can get a nice monthly average, or split the shares & bonds dividends in half (for quarters) or sixths (for months). For those who have to know, I think the three months to December 2015 give a total of around $2,000 (or about $670 per month). More than I was expecting – a nice surprise now that I am tracking it more accurately. 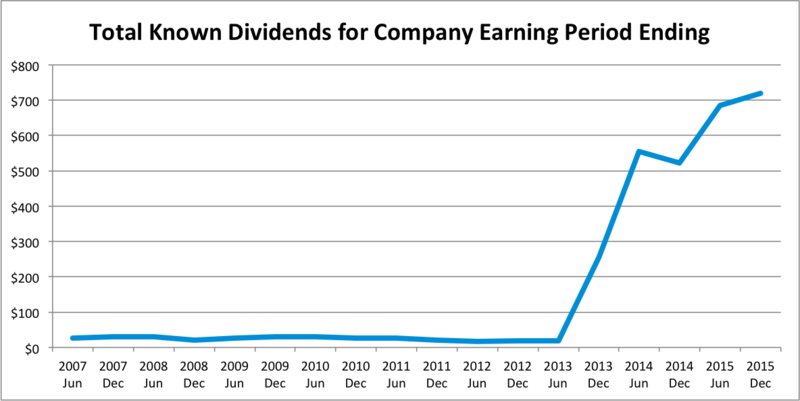 A very nice positive trend in your dividend line. Am I correct in saying that in H2 2015 you had 700 dividend? For the easiness of tracking, I use the date the money hits the account. That is easy to spot in the account overview and requires no tracking of who pays when. Yes – $700 (AUD of course, which is about $500 US) so far for 2015 H2. That will change a little as the last few companies announce dividends. The reason I don’t track when they come in is that the payments get lost amongst the other comings and goings in the account. I also track the performance of each share purchase (i.e. the same company purchased at two different times and two different prices). Some get paid in one large payment where as others pay in multiple groups for various reasons. So rather than tracking which group got paid when and then split it up when needed, I just track what should be paid (which can be done at any time without having to go back over bank account statements). Cool to see you are doing this. A nice graph already and together you’re earning a nice bit of passive income. If your way of tracking your income works for you, then go with that (I can see ATL’s point though). Thanks Tristan – I have only been tracking it recently, so we will see if it works. Previously I would just guess at the amount by noticing some of the dividends and having a rough addition in my head. Turns out I was about 50% off (as in 50% lower than expected). Always a nice discovery! I track ours in 2 ways, either using the direct info sent from Computershare or Link (etc) with the dividend statement. Or calculating it myself number of shares owned x declared dividend. Wow, that’s a serious dividend increase. Trending nicely. Me too, I am looking forward to the day when passive income managed to cover all “normal” expenses (the definition of normal is flexible based on how high I want to set/reset the bar). In March passive income covered all our expenses on paper, and I almost celebrated until I realized that we got a refund from a canceled holiday that reduced the expenses a lot. Still quite a way to go.